Calling all Gaelic speakers - and all who are interested in the language! 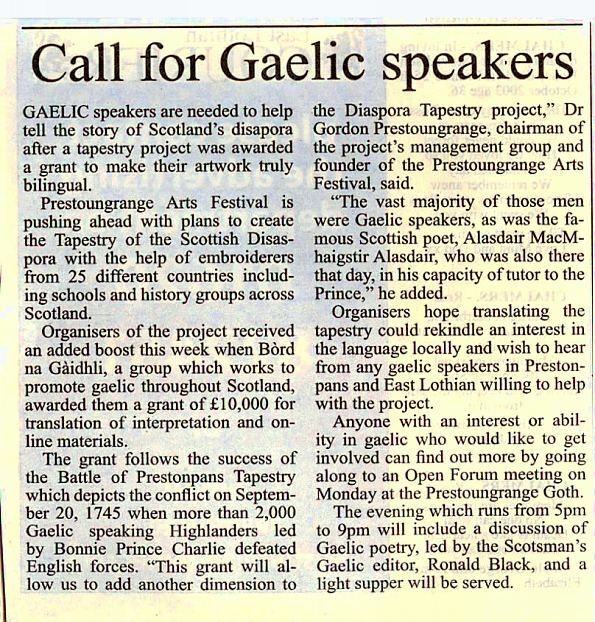 The Scottish Diaspora Tapestry team are delighted to announce that we have attracted a major grant from Bòrd na Gàidhlig to meeet the cost of translating our interpretive and promotional materials into Scots Gaelic! The evening will feature a discussion of Gaelic poetry led by The Scotsman’s Gaelic editor, Ronald Black, and a light supper will also be served. Anyone with an interest in the Gaelic language is very welcome to attend. Dr Gordon Prestoungrange says: “This grant will allow us to add another fascinating and exciting dimension to the Diaspora Tapestry project. It’s especially gratifying to receive the grant here in Prestonpans, the site of the greatest victory of the highland army of Bonnie Prince Charlie in 1745. The vast majority of those men were Gaelic speakers, as was the famous Scottish poet Alasdair MacMhaigstir Alasdair who was also there that day in his capacity of tutor to the Prince. A great many of the Scots who formed the Diaspora were also Gaelic speakers and in many places across the world the language has been kept alive to this day. Being able to fully incorporate Gaelic into our project is a fitting link between the history of the Diaspora and present-day Scotland. We are really keen to locate people in East Lothian who can help us with the Gaelic dimensions of the project and as a first step we invite them to come along to the Forum at the Goth." The Scottish Diaspora Tapestry project is now well underway and is making links with 25 communities around the globe with Scottish connections. Volunteers from each community will be involved in creating up to 10 panels, telling the Diaspora story of their community.